What colour does summer bring to mind for you? I suppose my first thought was the beach. Beautiful blue skies in every shade and soft golden sands in the palest to darkest hues. Not forgetting, of course, the bright yellow blazing sun. A classic combination, the blues and yellows which can work in pretty much any variation. Cornflower, sky, azure, aqua, teal or peacock blues with cream, butter, daisy, sunflower, sand and egg yolk yellows. Are those the colours of summer though? 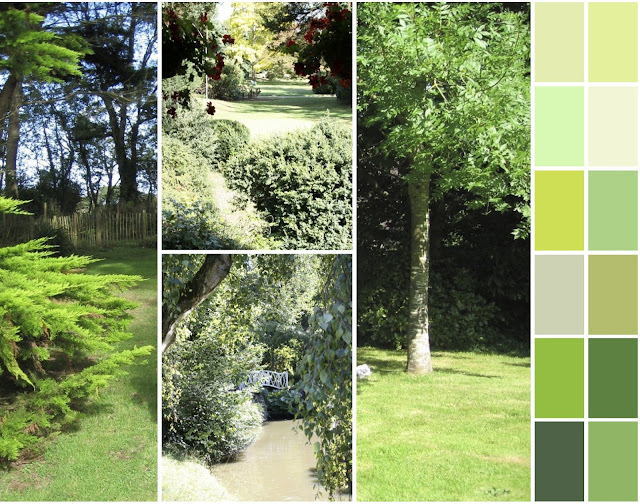 Or maybe it brings to mind the lush and verdant vibrancy of the greens that grow so well in the sun? Cooling, calming, shady greens. Green is a colour that I would never choose as a favourite but actually I find myself using it again and again. All those different tones from greyish sage, dingy olive, grassy green, zingy limes, soft mints and palest cucumber. They form a beautiful backdrop for almost every other colour but for me, summer couldn't be defined by one colour. Then, of course there's the more vibrant tones that the warmth of the sun brings. The bursting to life of beautiful flowers in almost any colour. Saturated vibrant reds and blazing oranges, hot pinks, deep purples and purest whites. 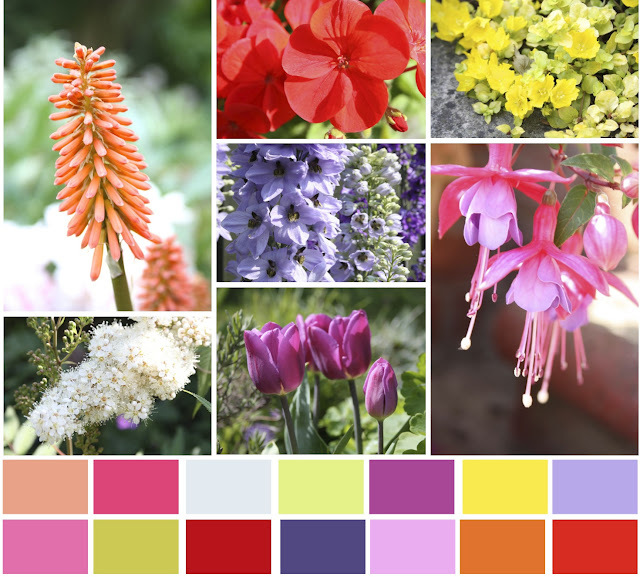 I think you could find a palette to suit any tastes in a garden full of blooms. Yes, this is getting closer to my idea of summer colour. My happiest memories of summer are of sun, days spent at the beach and the colour to be found there. Bright beach towels, stripy windbreaks, plastic buckets and spades, shops full of garish inflatables and steamers flapping in the breeze, melting ice-creams, pastel beach front hotels and rows of deck chairs. 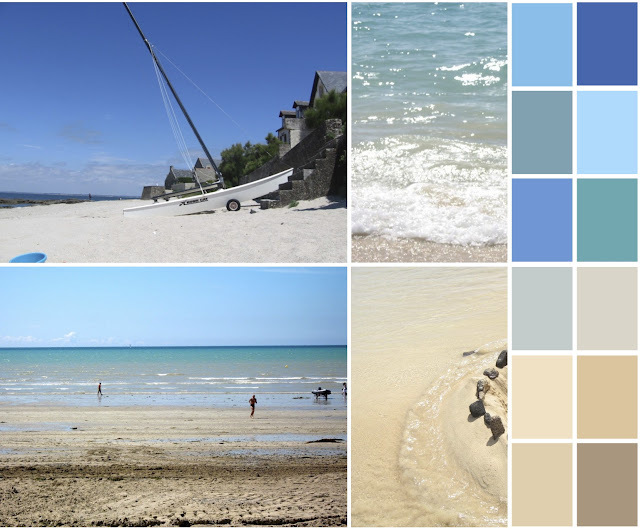 I've been having a play with palettes, as you can see and surprisingly, my attempt at a beachy palette summing up those bright holiday hues, comes out with a surprisingly muted and restrained range of colours, compared to the description of my memory above. I like it very much but it doesn't quite say summer the way I want it too. I think to me, summer is about the light and the way it makes the colours sing and shine so bright. 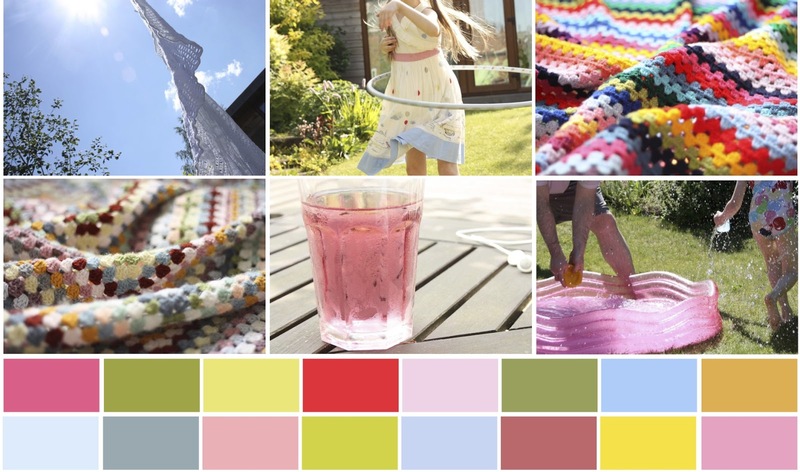 So my favourite summer palette would be about beautiful brights but also sweet candy pastel colours. While I was looking back through the archives for some suitable pictures for this post, I came across some snaps that I've taken here, at home. They seemed to speak of summer to me, so I pulled them out, wondering if they could be used. 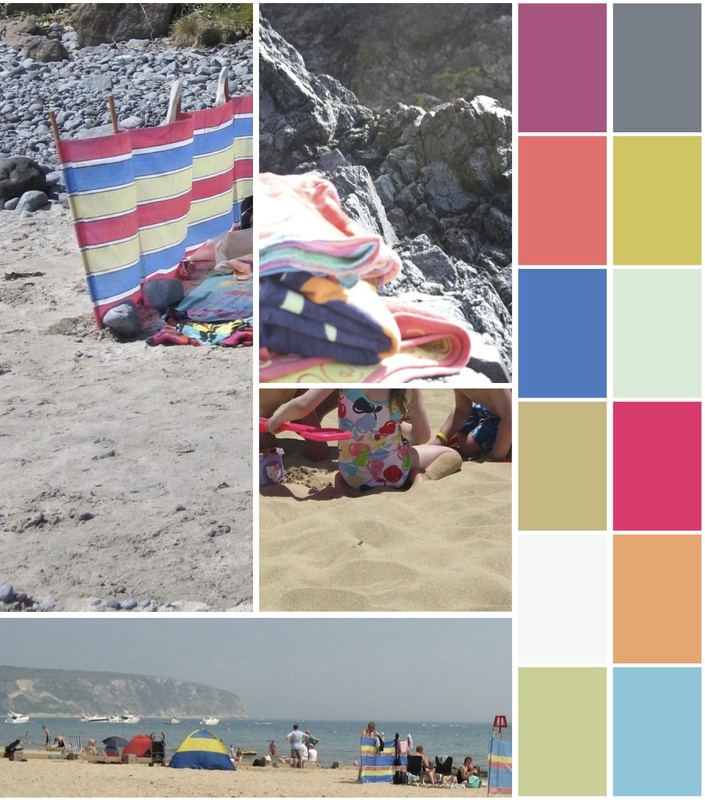 It's a funny thing, but when I put these snaps together and made a palette from them, the result was my favourite yet and also seemed to fit my idea of summer colour exactly. So that's the one I'll leave you with. These are the colours of summer for me. while I love to think of summer as all those vivid flowery colors....our hot dry summers usually turn our gardens to burnt umber!!! The last series (for me) is a true summer palette--of happiness. You had me at the sandy blues! Love your palette mosaics. I love your collages. I live in a place where you would mostly see browns and blues in summertime so it's lovely to see all that green. Lovely summer mosaics! My favourite is the first one because that is what summer always was for me as I was growing up! What a beautifully colourful (no pun intended) post - thank you so much for this! Sandra, great post! I love the "paint chips" next to the photos. It really can help a person "see" the colors in the photo. I love the last palette best of all! Love your pretty laundry cupboard too! Such beautiful colour palettes, the top one really reminds me of holidays at the beach!